At least four of five people on board are reportedly dead. On 1 August, Russian helicopter has been shot down by rebels in northern Syria, Russia's Interfax news agency quoted officials as saying. Defence officials say the Mi-8 transport aircraft had five people on board. Unconfirmed reports say at least four of them are now dead. The helicopter was returning from delivering humanitarian aid to the city of Aleppo. 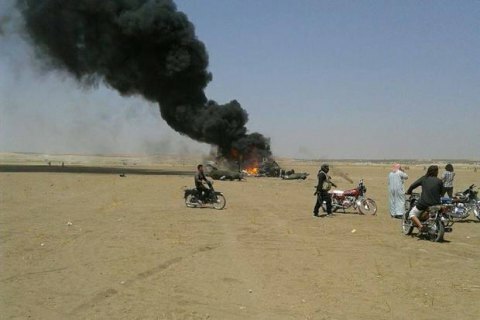 "On August 1, a Russian military-transport helicopter Mi-8 was shot down by gunfire from the ground in the province of Idlib. The helicopter that was returning to the airbase Hmeymim after the delivery of humanitarian aid to Aleppo had three crew members and two officers of the Russian Center for Reconciliation of the Warring Parties in Syria. The fate of Russian soldiers is being found out through all available channels," said the Defense Ministry of the Russian Federation. Meanwhile, social networks circulated purported photos of the downed aircraft, the pilot's ID (according to unconfirmed information, his name is Oleg Shelamov), as well as the bodies of the dead. On 8 July, two Russian military pilot instructors died in the area of Palmyra after islamist militants downed the Mi-25 helicopter. They were the 12th and 13th Russian military, whose death during a military operation has been officially confirmed. Russian military operation in Syria involving aircspace forces began in 30 September, 2015, when the Russia's Federation Council approved the use of Russian troops in the country. On March 14, Putin ordered the withdrawal of Russian troops from Syria, but an unknown number of troops still remain. Russia and Syria have announced the opening of what they called humanitarian corridors for civilians and rebels wanting to surrender, but few people are reported to have used them, fearing they would be targeted.